Alfonso Gomez began his martial arts training in Judo in 1969 and received his Shodan in 1974. In 1976, he began training in Karate and became affiliated with Ryuei-Ryu Karate under Arashiro Kyoshi in 1992. 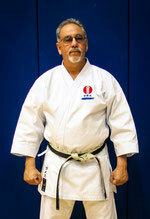 Gomez Shihan has been the Chief Okinawan Karate Instructor at the University of California, San Diego since 1986.